Last May, I spent a weekend down in San Francisco. I really love that city. I have been to SF more than any other city, somehow making it there at least once a year for as long as I can remember. On that particular trip, I made a trek to Omnivore Books – a charming cookbook shop. In my mind I was picturing Books for Cooks, a truly incredible cookbook shop in the Notting Hill neighborhood of London, where I spent many an hour gazing and drooling. Omnivore is decidedly less grand but still filled with incredible treasures. I had been reading about the new Ottolenghi book Plenty and was thrilled to see it at Omnivore. It had not yet been released in the States so consequently, I paid $60 for it. In addition to having charming names for vegetables, my copy has all the metric measurements. There was a time when I could rapidly double a temperature and add 32 to get Fahrenheit out of Celsius but sadly, these days I just use my Kitchen Pro app most of the time. But checking a phone repeatedly while cooking is not very efficient and so I wing it much more with this book than I would if the measurements were more “American” (read: antiquated and ridiculous). It feels almost sacrilegious to tinker with Ottolenghi’s recipes. Both of his books have imaginative, well-spiced, interesting, and delicious food. I tend to do things more by feel and taste with his books and I have a sneaking suspicion that he would approve. This is one of those “if you think you don’t like brussels spouts then try this!” recipes. I kind of like those smurf cabbages (my brother’s term). I loved them here. Be sure to let them get nice and brown. I served this with brown rice and plenty of hot chili sauce. I used a large cast iron skillet to make the whole dish and was able to cook the sprouts and the tofu in one batch. If you have a smaller pan, I would do each of them in two batches. You want to make sure tofu and the vegetables have plenty of contact with the pan and don’t end up steaming. First marinate the tofu. Whisk together in a shallow dish the chili and soy sauces, the sesame oil, vinegar, and the maple syrup (I used a Pyrex pie plate). 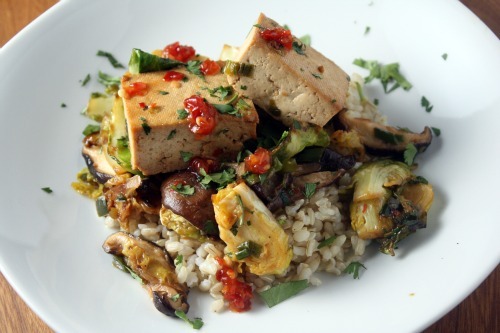 Cut the block of tofu into ½-inch thick slices and then each slice into 6 squares. Add the tofu to the marinade and gently toss. Allow to marinate, turning the pieces occasionally, for 30 minutes. Trim the bases off the sprouts and cut each from top to bottom into three thick slices. Heat a large skillet over medium-high heat and add just enough canola oil to coat the bottom of the pan. Add the sprouts along with a large pinch of salt and cook for about 3 minutes without stirring. You want them to brown a bit. Then stir them occasionally until they reach your desired degree of doneness (I like mine soft and not crunchy). Remove to a bowl. Add just a bit more oil and toss in the scallions, chili, and mushrooms. Again, allow to cook and brown, about 6 minutes in all, and add to the bowl with the sprouts. Carefully add the tofu to the pan and allow to cook for 3 minutes without stirring. Using tongs, turn each piece of tofu over and allow the other side to brown, about another 2-3 minutes. Add the contents of the sprout bowl, along with the remaining tofu marinade and the cilantro. Toss everything together gently and turn off the heat. Taste, and add salt as needed. I am enjoying Ottolenghi’s book as well. Just made their caramelized endive w/ Serrano ham. Yum! I am scared of those little white blocks, but I will graduate to finally try them. This looks delish. Dana, this is so perfect because I’m writing about tofu and cabbage today, and I’m trying to find a way to convince everyone it’s better than it sounds! I have the British version of the book too, and I have to use an iphone app for metric conversions. I’ll never remember how to convert in my head. 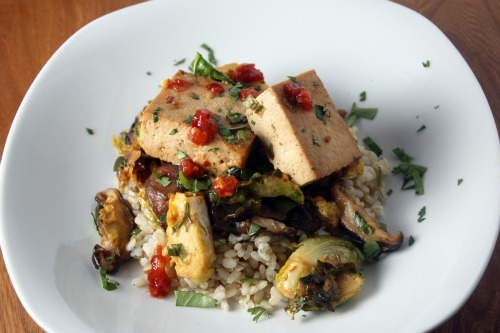 Your brussels sprouts and tofu look great. Love these flavors! believe it or not, my meat eating boyfriend has requested I make more tofu dishes. As I completely trust both you and Ottolenghi in this category, this one might have to be on the list to try. 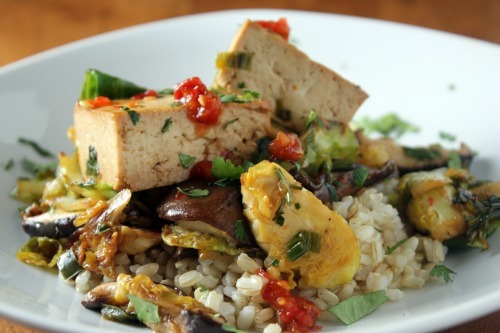 Could you suggest any other of your tofu recipes that really stand out? Thanks, as always, for such healthy and yummy looking food!! I love both tofu and brussels sprouts, so no need to convince me! I love how simple this is and I’ll be making this shortly! Dana, yours is the second post in the last 24 hrs I have seen from “Plenty”. This looks wonderful and I like that you served with brown rice…wish I had this for lunch now. I need to download that iPhone app! I officially ordered Plenty from Amazing and it should be coming soon. And I can’t tell you how excited I am! My version of Ottolenghi also uses grams and aubergine and courgettes even though I bought it here in the states so many they didn’t Americanize it that much? I already know I’m a brussels lover…which means this dish is more than perfect for me! This reminds me I need to go back to Ottolenghi when I’m in London next month. I love all their British-isms. My favorite is rocket. If they called it rocket here, it would be so much easier to get kids to eat their vegetables. i love the “british” vegetables as well…another fave is capsicum! i’m not a big fan of brussels sprouts, but i might have to try this–it looks too good! Great to see your photos of the dishes from this book! I debated picking it up when I was in London last month, but I ran out of room in my suitcase. There were so many delicious-looking recipes in it. Still, I managed to eat a wonderful lunch at their Notting Hill location. Made this last night – amazing! Thanks Dana! That looks amazing. I’m on a semi-crusade to get the hubby to like Brussels sprouts — I think he should like them in principle because they’re awesome, but part of me doesn’t want to share. This dish looks spicy enough that he would like it and I would get to eat my sprouts, too! AND shiitakes? I’ll die happy now. I like Ottolenghi as well and made a couple of their recipes; never made tofu but it is never too late to try! Little Ottolenghi fact – they’ve opened up a new restaurant in London called nopi. Neither Ele nor I have been yet – I’m not entirely sure what the concept is and how it differs, but I will let you know when I experience it! Ahh you’ve posted so many amazing Ottolenghi recipes.. I must get these books! !